The Laughing Badger has long been a popular stop for travelers, merchants, and adventurers bound for distant lands. The last stop on the fringes of civilization, this inn offers a warm bed, fine meal, and the company of a friendly and welcoming staff. People from miles around all agree that the Laughing Badger is without peer. No one would think of harming the family that runs this fine establishment ... until now. A Dreadful Dawn, the fourth of Green Ronin's Bleeding Edge adventures, finds the characters fighting for their lives in the unlikeliest of places: amongst the comforts of a fine inn. In this exciting new scenario, the PCs are drawn into a sinister plot by a vicious cult with their own plans for this innocent family and their guests. The characters must save the innkeepers from a gruesome night of murder, terror, and appalling violence, and defeat the servants of the foul God of Slaughter before it's too late. A fully detailed tavern complete with statistics and descriptions for all locations. An intricate scenario that evolves based on the PCs' actions. A dreadful dungeon complex filled with traps, monsters, and a sick cult with foul ambitions. A slew of detailed and compelling NPCs perfect to add to your ongoing campaigns. This adventure, like other Bleeding Edge adventures, offers a complex plot, a cast of detailed characters, and deadly encounters. A Dreadful Dawn is chock-full of dynamic environments and developed NPCs that, when combined, promise to take your games to the Bleeding Edge of Adventure! 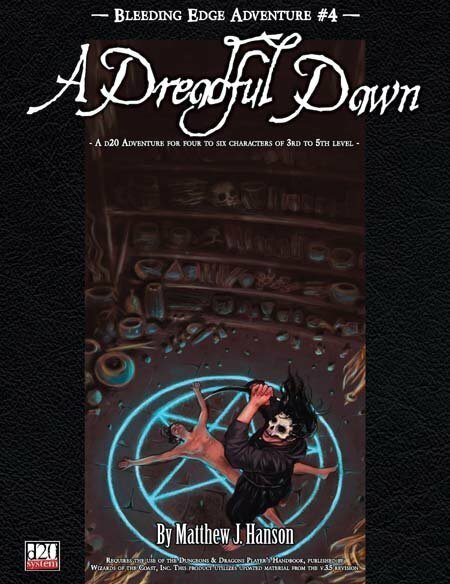 This PDF Web Enhancement details how to adapt A Dreadful Dawn into the True20 System.